Melville, NY, February 01, 2018 --(PR.com)-- Franklin First Financial. Ltd. (www.franklinfirstfinancial.com) announced today that David P. Stein has joined their growing firm as their new Chief Operating Officer, responsible for overseeing all areas of operations within the company. Franklin First Financial. 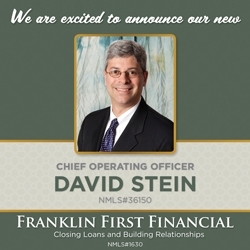 Ltd. (www.franklinfirstfinancial.com) announced today that David P. Stein has joined their growing firm as their new Chief Operating Officer, responsible for overseeing all areas of operations within the company.